As mentioned in the previous blog post, we will build out a Soviet Tank Brigade. Tank Brigades were both standalone (early war 1941) and then became the building block that Soviet Tank Corps were built around. For our example of a Soviet Tank Brigade, if we go back to the BSSA and look under the front reserves we can see that the 18th Tank Corps was part of that reserve. The 18th Tank Corps consisted of 3 Tank Brigades, one of which is the 110th Tank Brigade. We will use this unit as our typical Soviet Tank Brigade. 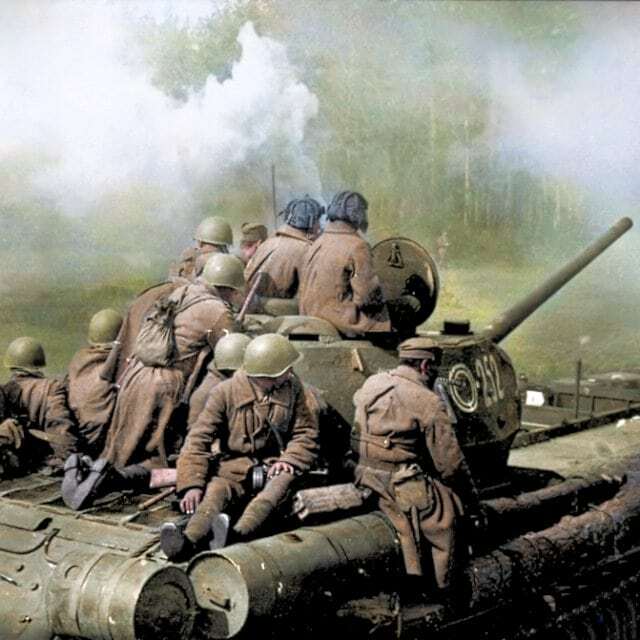 By late 1943 the Soviets had established the final Shtat for its Tank Brigades. Prior to this they had issued many different shtats with many different tank makeups. This makes it difficult to establish which organization to use during the early war period. 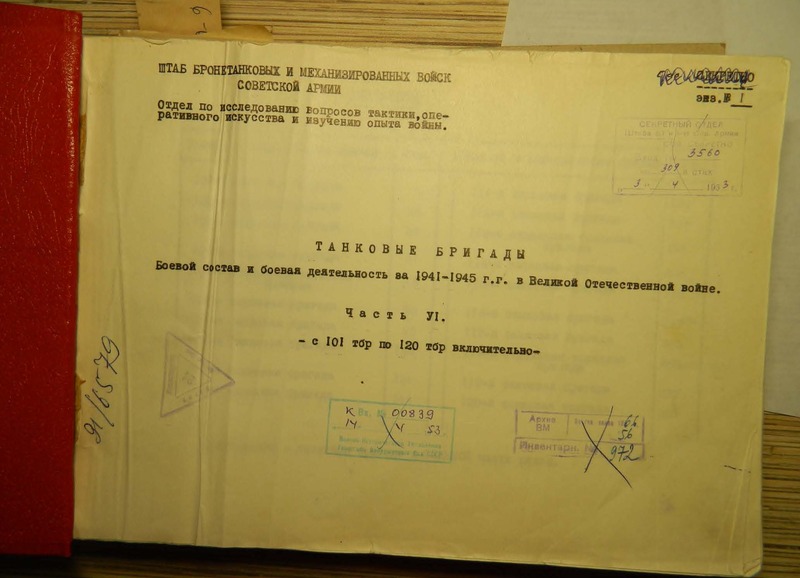 This latest Shtat (010/500) established the brigade to have 65 tanks in three Tank Battalions. 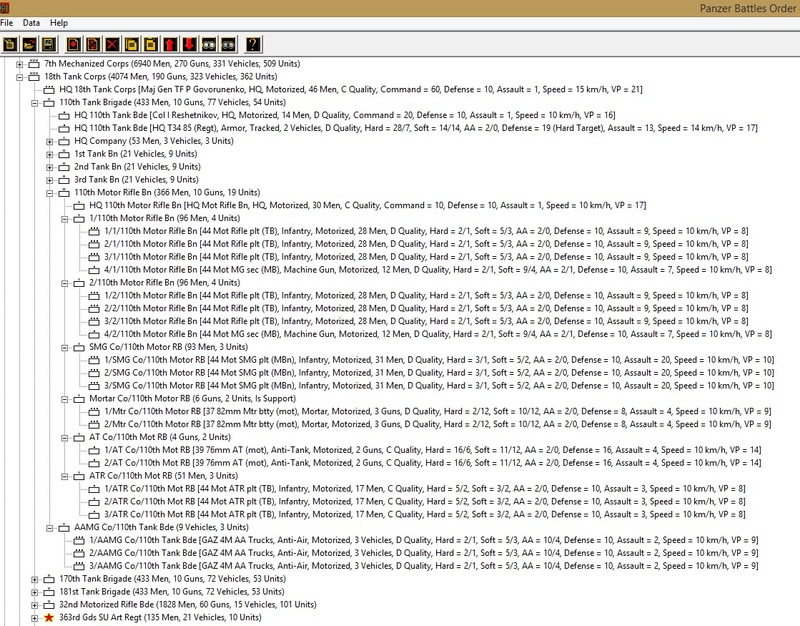 Below is a copy of the shtat, and I have translated the combat units so it can be followed easier. Looking at the Tank Battalions, each had 2 tank companies, each with 3 platoons of 3 tanks and 1 tank for the company commander. In addition, there was 1 tank for the battalion commander for a total of 21 tanks per battalion. 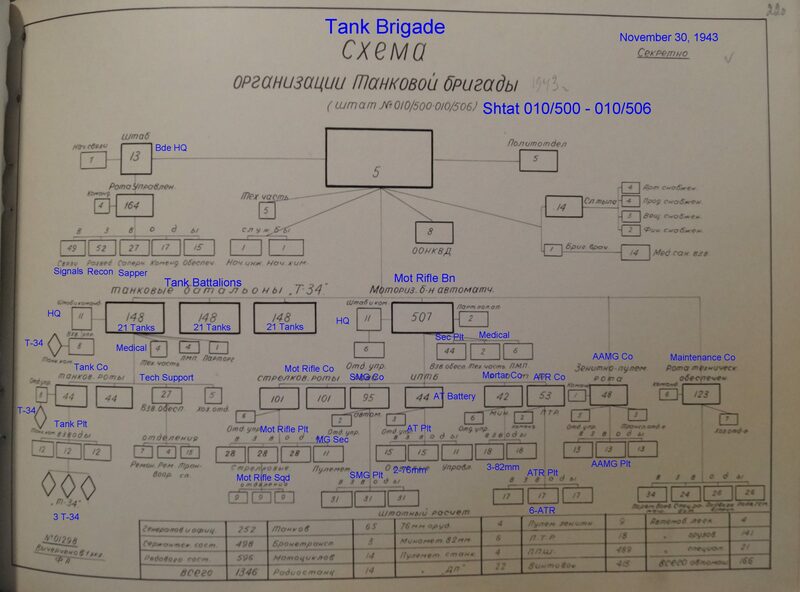 Not shown on the chart was 2 tanks under the brigade commander. The Motor Rifle Company consisted of 2 companies of truck borne riflemen, each with 3 rifle platoons and 1 MG section. Next there was SMG company of 3 platoons, an AT company with 2 AT platoons of 2 76mm guns each, a Mortar company of 2 platoons each with 3 82mm mortars, and finally an AT Rifle company of 3 platoons each with 6 AT rifles. The AAMG Company had 3 platoons, each with 3 12.7mm MG mounted on a truck. The last units to look at are in the upper left of the chart. This is the HQ company which besides the 2 tanks of the brigade commander also had a mounted recon and sapper platoon. At this time period, the tank brigade had 3 tank battalions and a mot rifle battalion, the AAMG was not always present. Let’s look at the Tank Brigade books I have from the Soviet Archives. 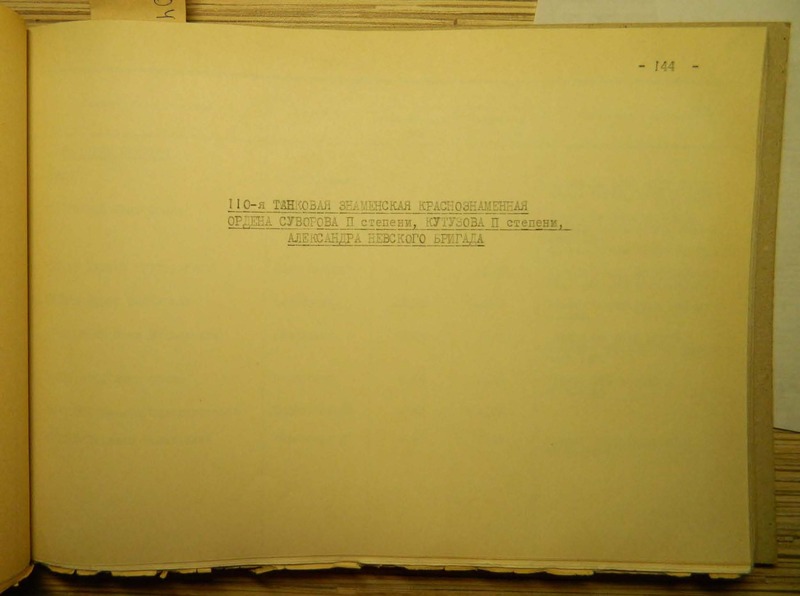 Below is the title page from volume VI coving the 101st to the 120th Tank Brigades. A nice feature in the book is that it gives the Tank Brigades full name at the end of the war , along with the commanders and chief of staffs throughout the war. 110th Tank Znemansk Red Banner Order of Suvorov, Kutuzov, Alexander Nevsky Brigade. 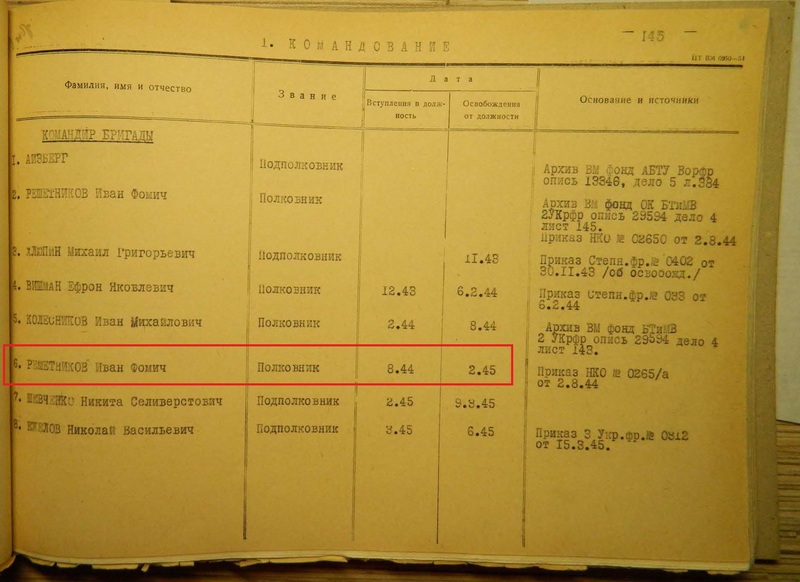 On the next page, we see that the commander of the brigade at the time of the Konrad Operations was Colonel Ivan Fomich RESHETNIKOV, commanding from August 1944 to February 1945. The last page from the book shows the units that made up the brigade on the 1st, 10th, and 20th of each month. The boxed area, indicates the period of January 1, 1945 to February 1 1945. This shows in order, 1st, 2nd, 3rd Tank Battalions, the Motor Rifle Battalion, the AAMG Company, and the HQ Company. The “Sword Behind the Shield” indicated that the 110th Tank Brigade was at full strength but consisted of the mixture of T34 76s and T34 85s. With this information, we can now create the OOB of the Tank Brigade. First, let’s look at the Tank battalions. With the tank strengths indicted in the book I made the 1st tank battalion with T34 85s and the other 2 battalions with the T34 76s. Next, we see the Motor Rifle Battalion and the AAMG Company, which completes the OOB of the Tank Brigade. 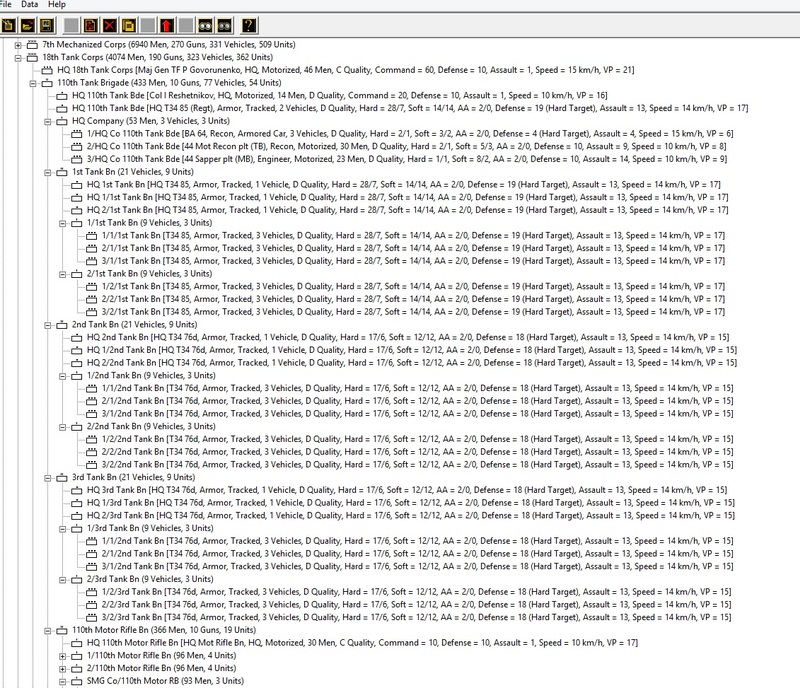 As you can see, having the tools and the data at hand makes creating an accurate OOB very easy. That concludes our post for this week. I have the 110 Tk Bde with 37x T-34 (mixed between 76mm and 85mm) on Jan 1, 1945 from Sword Behind the Shield. Unfortunately I don’t have the page number for the reference. There are tables in the back that list the numbers in the unit and I believe the text in the chapters note the strength of each tank brigade. My notes say that the 110 Tk Bde has 15x T-34 on Jan 5 from combat in Konrad I. Számvéber has a table that shows the brigade receiving 34x T-34 and 20x SU-76M between Jan 22 and Jan 24. There is no mention of number of infantry but I scaled the number of men based on the same percentage of available tanks with respect to full strength. In the rest of the 18 Tk Corps, 170 Tk Bde has 27x T-34 and 181 Tk Bde has 43x T-34 on Jan 1. The whole corps had 117 operational of 134 T-34 (76mm and 85mm). We build the OOB to full strength and then reduce them in the scenario editor, so yes I have those charts in the book with the correct number of tanks. If we build them to the correct strengths on Jan 5 then when replacements arrive we could only build them back to that Jan 1 strength. What are you building this OOB for if I may ask? I’m designing a board wargame on the Konrad Operations at battalion scale. Apologies, we authorise all comments after they are posted as an anti-spam measure. For some reason I was not notified on your post (or Javier’s that followed) and it was delayed being posted. I’ll keep an eye out for any follow up questions you have. I do have some questions for myself as I’m continuing my own research. 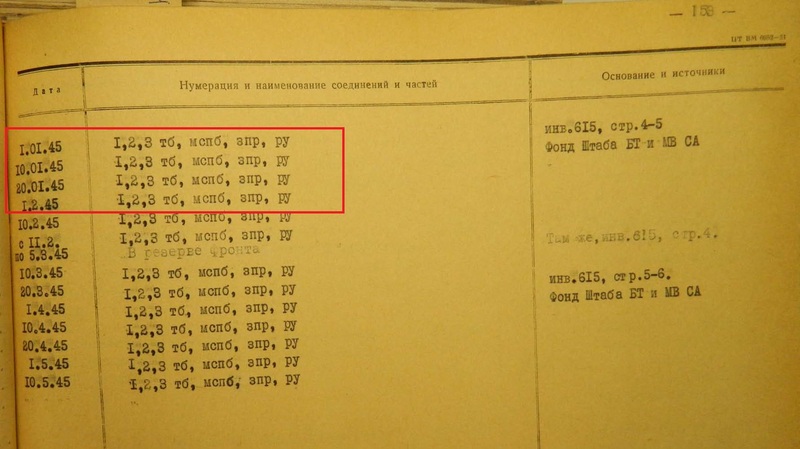 The one question I asked earlier in my comments is to see if there is information on the number of men in the other 4th Guards Army Rifle Divisions in January 1945. I’d love to see more articles from Michael as I’m researching this in parallel. His write up is very engaging and the method of research is very similar to my own. I have my OOB complete and reviewing it to correct or detail out pieces of it. If there’s a way to exchange information and ideas on this topic here or offline that’d be great. The hard value is low for AT rifles. Bloody maravellous Mike et al! May I ask how you would calculate replacements. both for local (ie, rehabilitated, relocated, recovered etc., and for national/regional such as bew recruits or mobilized forces)? Thanks for all you hard work and efforts!